This chair is one of 262 to have been commissioned for the US House of Representatives in 1857, after a design by Thomas Ustick Walters. 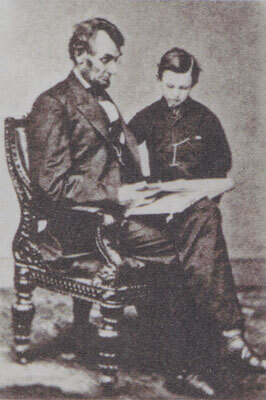 But this particular chair, although since reupholstered, was used when Abraham Lincoln and his son, Tad, were photographed by Mathew Brady ahead of the race for the 16th presidency in 1860. The image went on to become one of the most poignant and iconic of the era. The chair was part of a much larger order that included desks and the items were crafted by Bembe&Kimbel of New York, Doe Hazelton&Co. of Boston and Hammitt Desk Mfg. Co of Philadelphia among others. Lincoln, of course, went on to win the presidency and later gave the chair to Brady who used it in images of four other US presidents. Indeed, its list of ‘sitters’ reads like a who’s who of American history makers. Other sitters include myriad senators and civil servants, Civil War soldiers from both sides and of all ranks, Justices, Native Americans and citizens, both prominent and anonymous. When used in Brady’s group portraits, the most important figure in the group is shown seated in this chair. Interestingly, no women are seen gracing its seat in the photos. This was in part down to the very practical reason that it wasn’t wide enough for the fashionable hoop skirts of the day. This stately chair demonstrates bold proportions, dynamic patriotic carving and a commanding presence. The chair retains its original surface, which has darkened and has an alligatored appearance that contributes to its appeal and rarity. It is not only an important survivor from a significant official US commission, but also the physical support for portrait photographs of the most prominent people in 19th-century US history. There is perhaps no other single object that links so many significant historical figures. 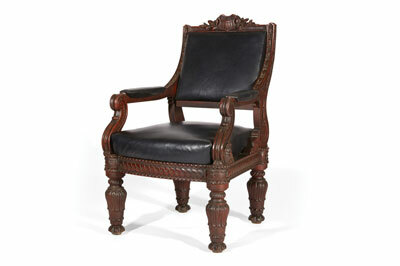 The Lincoln Chair far outreached its estimate, eventually selling for $449,000.